College Park is a great place to live and do business, but being so close to the Atlantic has disadvantages, such as the occasional storm that passes overhead. We get a deluge of water dropped onto our region, and sometimes the excess flows into someone’s basement or the front offices of their place of business. When this happens, the professionals at MD Water Damage Restoration are ready to go to work. We are licensed, bonded, and insured restoration experts, equipped to handle the severe water-damages Mother Nature causes. Our trained teams have served Maryland customers since 2001, carrying many combined years of expertise and knowledge into every project as we conduct emergency water extraction and damage restoration in any residential or commercial structure. 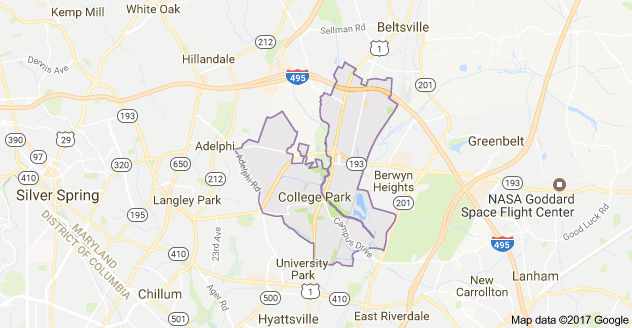 If your home or business is in College Park or its surrounding areas, call us at 1-888-743-3045. Our phones are open 24/7, and we guarantee a response within 30-60 minutes. Your property will be restored up to its pre-flood condition in a timely manner so that you and your family or employees can get on with your life. Natural disasters aside, water issues can have a number of different causes. Water pipes running through a basement can break, spewing a few inches of water onto the floor before you can shut off the water. When this happens, it’s time to call in a professional restoration service right away. You can’t afford to delay if you have a standing pool of water in your basement or any other part of the building because the longer you wait the worse the water damage becomes and increases the threat of secondary hazards. The best thing to do is call in an extraction specialist quickly before the water ruins everything it touches. We will send one of our professional teams to your home or business, whenever you call MD Water Damage Restoration, ready to inspect your premises and start their restoration process. We have been extracting water from flooded basements and giving our residential and commercial customers top-quality damage restoration for more than 15 years. A flooded basement can ruin more than structural materials like drywall and wood; it can also have ruin the content of any flooded area. When appliances, furnishings and other items contact water for an extended period, it can lead to expensive restoration. If the contact continues too long, some items can fail irreparably. Excess water from a flooding event can inflict the worst kind of water damage to your home or business. This should not be treated as a typical DIY project. The affected area must be pumped out as soon as possible then completely dried and properly treated with professional grade sanitizers to reduce the risk of secondary hazards that could put your family or employees at risk. Mold – Molds and other fungal infestations can stem from water damage that was left unrestored for an extended period, or if the restoration was not handled correctly. When moisture is left unabated in a place with oxygen and an organic surface, such as structural wood inside of a wall, then this is the perfect environment for microscopic mold spores to settle and multiply. Then the occupant of your property can have health issues. Black mold, a common infestation, produces airborne toxins that lead to respiratory problems, inflammation of the skin, nausea, and more. Other symptoms include hemorrhage, mental impairment, and memory issues. Bacteria – If allowed to stand for 48 hours, even “clean” water becomes stagnant, filled with millions of micro-organisms, which is a critical health hazard. On the other hand, when a sewage line breaks and floods your basement or other parts of your premises, this kind of emergency begins with serious health issues. Either scenario requires the careful handling of a licensed extraction service. Carpets and carpet padding – Carpeting, rugs, and carpet padding ruin quickly when contacted by moisture. If it is not exposed too long, and if the water is not already contaminated, a professional might be able to salvage the material. Biohazards and contaminants – Water that seeps into your home from outside picks up dangerous contaminants, such as oil and fuels from cars and trucks, lawn fertilizers, and animal waste. This also needs to be extracted by a professional crew with the training to safely deal with this type of health hazard. MD Water Damage Restoration teams are IICRC-licensed to deal safely with such contaminants. Loss of personal property – The key to reducing your losses and restoration expense when a flooding event begins is calling a professional extraction service like MD Water Damage Restoration right away. The need for promptness in a water-related crisis like this cannot be overemphasized. Damage to your building’s structural material – Calling for specialists at the outset of a water crisis, will ensure that standing water will be removed quickly and properly, which will help preserve the integrity of your property’s structural components and its contents. The longer it stands, water sinks deeper into structural materials and the surrounding content of a flooded area. Moisture will creep under any floor covering like tile or carpet and into the main floor material underneath. Other building materials – Even concrete, brick, or hardwood will be slowly weakened the longer it remains in contact with water. Moisture works its way into miniscule cracks and holes making it prone to further damage. A restoration professional must use special drying techniques to protect these types of materials. Although every job requires an individualized restoration plan, our teams will start with a general set of procedures for each water damage project. We are available 24/7, so call 1-888-743-3045 with any questions or to set up an appointment. Full damage assessment – If water is still coming into your home or business, we will find the point of entry and fix it. Then our team will assess the water and all affected areas. Identification of flood water type – In our industry, water is typically categorized by its source and the contaminants it contains. Our experts are trained to know how to identify any water type and safely extract it. Water removal – Truck-mounted pumps will remove the pools of water from your premises early in the process to minimize damage to structure and contents. Then our specialized equipment will help us find hidden areas of moisture so we can dry them out. Classify the water damage – Contents must be removed and salvageable items set aside for cleaning. The water damage inside your structure will be assessed, including surfaces that require special treatment like hardwood. Dry property and structure – To prevent the onset of molds, powerful fans, electric panels, and dehumidifier will be used to eliminate all excess moisture. Restoration of property – Content that can’t be restored will be taken away with damaged structural debris for disposal. Then affected areas are scrubbed with professional-grade detergents and antimicrobials to prevent infestations. Insurance claims support – We will provide your insurance provider with all documentation and photos showing our restoration process from beginning to end. Our people will work through the claims process with you to help get the best possible recompense. We want to restore your property to a condition at least equal to its pre-flood quality. The restoration technicians at MD Water Damage Restoration have worked water disaster projects that sprang from a variety of sources. Burst or frozen pipes – Freezing temperatures can cause an unprotected pipe to break, creating a mess in your home or business. Call us and we will take care of the problem. Leaking pipes – When old pipes wear out and break, causing a lot of water damage in your home or business, the flooded areas have to be cleaned and dried thoroughly. Then we check walls, floors, and other areas for possible biohazards. Sewer line backup – A broken sewage line requires specialized handling by trained professionals because of the contaminated water. Don’t try to do it yourself. We have safety equipment that will ensure removal; also, your property will be completely sanitized with no lingering odor. Faulty appliances – Appliances like washing machine malfunction sometimes and lose their water. If this creates a problem in your home, call MD Water Damage Restoration and we will come clean up the mess, completely dry the affected area, and restore any damage. Hurricane and storm damage – Violent storms rain a flood of water down on us, and if we don’t seal all our windows and doors well, some of it will leak into our basements. Our professional-grade equipment can remove that water, then professional teams will restore any damages. Water leftover from putting out a fire – Water is the best tool to fight a fire, but that part of your structure that survives the blaze will have heavy water damage. Our people will use heavy pumps to clear out any standing water. Then the water-damaged areas will be cleaned, and restored. Having served Maryland customers since 2001, our teams have experienced all types of water damage in the various service areas we cover, including flood damage, flooded basements, and other water-related disasters. If you live in the College Park area, you can call MD Water Damage Restoration anytime; we are available 24/7. One of our licensed and trained restoration teams will arrive at your property within 30-60 minutes.